SURGE held its annual China-U.S. Symposium on April 13th-14th. This symposium was composed of four panels, a lecture, and a keynote speech by Singaporean Ambassador to the United States Dr. Ashok Kumar Mirpuri. Following a riveting panel entitled “A Nuclear North: What Korea Means to Sino-US Relations,” SURGE presented the David Rawson Memorial Lecture by Dr. William Overholt. The David Rawson Memorial Lecture honors the life of David Rawson (A’07) who had been a student in EPIIC and had studied abroad in Hong Kong. His life was tragically cut short the summer after his graduation. Previous David Rawson Memorial Lecturers include Ambassador J. Stapleton Roy and Dr. Victor Cha. Dr. William H. Overholt is the President of Fung Global Institute, a Senior Research Fellow at John F. Kennedy School of Government, and the Principal of AsiaStat LLC. Prior to his current endeavors, Dr. Overholt worked in the private sector and spent 21 years in investment banking. Dr. Overholt has published numerous books, with his most recent work titled “China’s Crisis of Success” (Cambridge University Press, 2017). This recent publication inspired Dr. Overholt’s lecture at the China-U.S. Symposium in which he shed light on China’s economic condition and the challenges China and the U.S. may face in the future. Dr. Overholt opened the lecture recounting his process of writing “The Rise of China” (W.W. Norton, 1993). This was the first book to predict China’s success in the realm of economics and geopolitics. Dr. Overholt compared China’s present economic state to South Korea and Taiwan’s miracle economic rises. Following this comparison, Dr. Overholt detailed how former Premier Zhu Rongji’s political and economic reforms were initially disliked, but later appeared to be prescient in the era of former General Secretary Hu Jintao and Wen Jiabao. Dr. Overholt shared his insight into the significance of current General Secretary Xi Jinping’s crackdown on corruption. Dr. Overholt expressed his view that these are not the actions taken by a confident leader, but instead that they display the instability in China that could create conditions for negative outcomes such as potential capital flight. 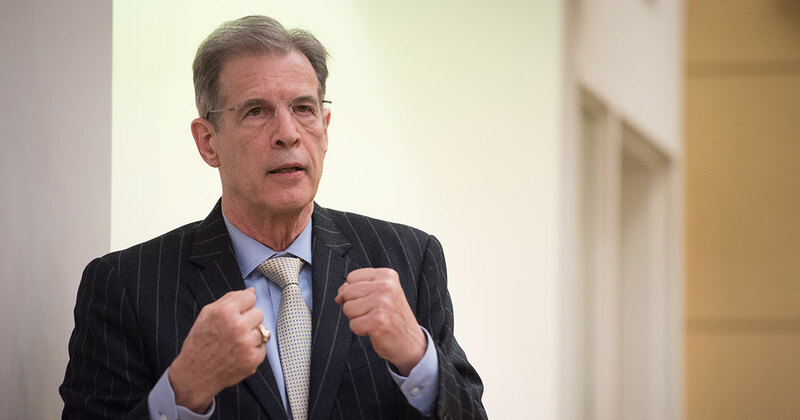 Following his lecture, Dr. Overholt drew upon his wealth of private sector and academic experience when answering undergraduate and visitors’ questions. One student asked about his views on Chinese investment in African nations and concerns of neocolonialism. Dr. Overholt spoke on his views of Beijing’s One Belt One Road initiative as a net positive for nations partnering with China, while also drawing attention to the potential threat of large debt accumulation by partner nations.